A new Apple Watch Series 4 is coming for sure! Let's talk about how we know that it is coming, when it is coming, and what rumored features will be included. Prior to sale, some countries require permission to market devices using encryption by way of filing with the Eurasian Economic Commission (EEC). Since Apple's watchOS devices are encrypted, Apple has recently filed with the EEC, including six new model numbers, all running watchOS 5. This same thing happened last year, shortly before the Series 3 was released, which actually had eight new model numbers. And, its also happened with the 2018 iPad, and the MacBook Pro. Given that six models have been filed for, instead of eight, Apple is getting rid of a certain model for this year's lineup. It's most likely going to be either the Apple Watch Edition, or the non-LTE aluminum model. As for pricing for the Series 4, there's no way to know for sure, but give history, we're fairly sure that the cheapest models will range from around $329 to $399. 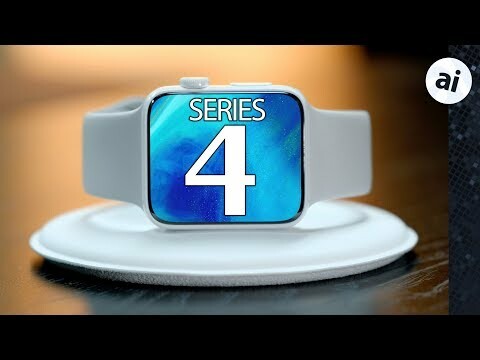 Since each new Series 4 model is coming with watchOS 5 installed, this means that the Series 4 will likely be revealed at Apple's September event, just like the Series 2 and Series 3 watch releases. The rumor mill has already started churning about the Series 4 Apple Watch. Ming-Chi Kuo says that the new watches will have a 15-percent larger display. Now this could either happen by making the chassis larger, or by slimming the bezels around the screen -- and we think it's the latter. Kuo also believes that the new watches will have more battery capacity, and improved heart tracking capabilities. There's also rumors that Apple will switch from spring-loaded Side and Digital Crown buttons, to solid state haptic feedback buttons, like on recent iPhone home buttons. The main benefit to this seems to be better water-resistance. Apple and TSMC are rumored to have already started production of new MicroLED technology displays for Apple Watches to increase battery life. Production cost is between four and six times higher than existing OLED Apple Watch panels, so if we do see MicroLED displays, they may only be available on higher-end Apple Watch models, like the stainless steel and Edition models -- should the latter survive the model purge. Some rumors also point to the Series 4 supporting the Qi wireless charging standard, as opposed to the modified one that the Apple Watch uses now, so you can use any Qi wireless charger to power the device. Last year's series 3 had 8GB of storage for the Wi-Fi only models and 16GB of storage for LTE models. We think the Series 4 will come with 16GB of storage, and maybe even 32GB on stainless steel and edition models. As far as connectivity goes, we also think it'll come with Bluetooth 5 instead of Bluetooth 4.2, since Apple's recent MacBook Pros now support Bluetooth 5, and we expect the new iPhone lineup will too. There's also a chance we'll see a small boost in RAM as well. Like I mentioned earlier, improved heart-rate monitoring has been rumored, as well as others, like improved health-tracking options and UV sun exposure tracking. Non-invasive glucose monitoring has also been rumored -- meaning you wouldn't have to poke yourself all the time, or insert a probe under your skin. But, the technology is probably years away, and likely won't be seen on the Series 4. With the Series 4 launch on the horizon, deals on Series 3 watches are heating up. Apple authorized resellers are currently knocking up to $75 off the devices, according to our Apple Watch Series 3 Price Guide. Be sure to check back often as new deals are added daily. I have an jet black iPhone 7 that I love. I'll probably update it this year, but honestly it's more because I like shiny new items than because the new ones are that much better. The watch is a different story. The changes each year for the watch have been pretty huge. Series 2 introduced huge increases in speed and battery life. Series 3 introduced LTE. I'm very excited to see the improvements in Series 4. I'm hoping to more battery life, bigger displays and better heart rate tracking (I doubt that my heart rate is really 54 when I'm running flat out). I'm also hoping for more speed and a better speaker. With watch OS 5, I think there will be a lot more times when I'm willing to leave my phone at home. I love listening to podcasts, so this alone is huge. Glucose monitoring isn't going to happen. That would make the Watch a medical device that would require many, lengthy approvals in every country they sell it in. The tech also isn't there yet. It’s an even better bet that the new iPhones will have Bluetooth 5 since the current lineup has Bluetooth 5. I am looking forward to the front facing camera, face recognition, and FaceTime communications. Probably not this year, but could be a year or two out. Well, a camera on my watch is not anywhere on my wish-list. YMMV, but that's what my phone is for. Apple has been talking to the FDA and other government organizations for several years now. While it’s unlikely that we will see this in September of this year, I’ve no doubt they’re working on it. We already know that Samsung is. I can’t believe that Samsung would be working on this if they weren’t pretty sure that Apple was too. If they don’t add a SCSI port this time round then that is IT! I SWEAR TO GOD I’m just about very nearly almost had enough of their lack of effort for pros. If they drop the aluminum non-LTE Watch, I'll only own one. There's no way I'd pay for a cellular radio that I'll never use. Having to pay full time for LTE for two or three or more Watches is a deal breaker for me. If I had an S3, I wouldn't consider an S4, but right now my Watches top out with an S2. So here's hoping that they keep it, so I'm not stuck with just one color. I certainly hope there is an update to the HR sensor - just because Apple has put some much effort and investment into their health initiatives, it would be a shame to see Gen 4 come and still have the original sensors. Surely there is some reasonable improvement to include there. - Enough battery life to allow some type of always on watch face (or rather - configurable so you could have it always on from 9am-9pm, as example). Can be dimmer when not active, but something to showcase the great watch faces rather than a black screen. BT5 would be a solid update to support wireless connectivity for the next decade - better b/w and lower power. With the series 3, you don't have to set up the cell modem if you don't want to. It's just present in the watch. I can't imagine the series 4 being different in that regard. The aluminum LTE model also switches to the ceramic caseback and doubles the onboard storage. It's a decent upgrade. I wouldn't be at all surprised if they make that the new baseline by just dropping the non-LTE model. Reducing internal differences is a very Apple move. Keen to upgrade my series 1 watch which is functioning fine but I would welcome a better heart rate monitor and better water protection etc. Testify! I want Series 4 to be more like a Mattel Power Glove. Only with more power. Oddly, this is the one feature that would lead me to consider upgrading my AW. I take snapshots mostly, not pictures. A point and shoot on my wrist would be useful. "Wish I had a picture of that" happens way faster than I can reach for my phone. Point and shoot blind is fine. You do realize that you pay more for an S3 + LTE than one without, right? Right? So why should I pay $70 EXTRA for additional LTE watches that will never see LTE used? If the carriers dropped the cost for additional Watches to the same account (they won't) then paying extra for the cellular version wouldn't bother me. Or if Apple dropped the price to $329 for GPS + cellular, I'd be fine with that. But that won't happen either. If the AI article is correct, the non-LTE version would be SS, BSS, and Ceramic. And you do know they're more expensive than $70, right? So maybe you understand why I don't want to see the aluminum GPS only version dropped. I can't see that happening. That would make people in public stop saying, "Ooo, an Apple Watch!" and start saying, "Ew, an Apple Watch." It’s what smart watchbands are for. And without an Ethernet port, how am I supposed to connect to the office network? Seriously, I'm almost regretting my Series 3 at this point. If I'd held out just another year I could have bought a Series 4 instead, and then regret not being able to get a Series 5. I asked a friend something similar: how long before there's an embedded camera under the screen *and* will orient itself so that whatever/whoever you're filming will always appear right-side up?